Setting off to work in the morning can be an arduous task in winter. You often have to wait an age for the windscreen to defrost and clear, and even if you’ve scraped the ice from the outside, the inside seems to steam up the moment you get in. Plan ahead to save time in the mornings by putting an RAC windscreen cover on the night before. 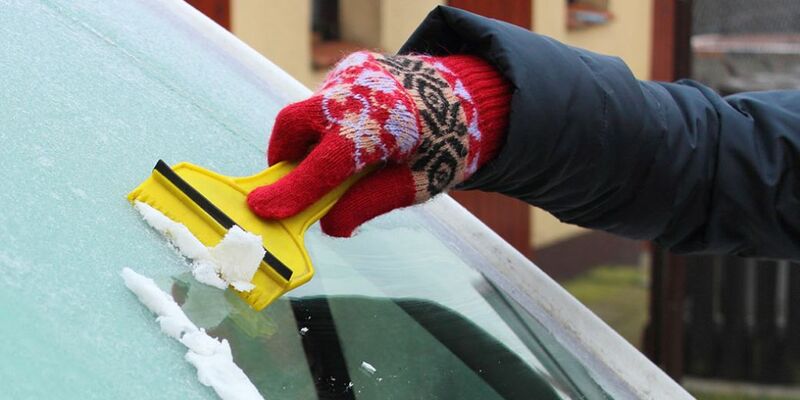 We recommend allowing about 10 minutes to clear your windscreen thoroughly using a scraper and de-icer if necessary. Don’t forget about the other windows, mirrors and even lights as well, they’re just as vital for safe visibility and are often ignored, limiting your vision, especially at junctions. You can buy everything you need to de-ice your windscreen in the RAC Shop. 3. Keep a bottle of de-icer in your car. Squirt it on the outside of the screen if it’s frozen over in the morning, using a proper scraper (not a bank card or CD case) to wipe away any excess water or ice crystals. An important point here – DO NOT pour a kettle of boiling hot water over the windows in an attempt to melt any ice. The thermal shock (going from sub-zero temperatures to nearly 100 degrees Celsius in a matter of seconds) can crack your windows, leading to an expensive bill. To stop the inside from misting up - which is caused by hot, wet air - use the heater but start off cold, then slowly increase the temperature as the air dries out For more information on how to most effectively clear the inside of your windscreen read our how to demist your windscreen in double-quick time page. Don’t be tempted to wipe the inside of the screen with a cloth. Although it might give you short-term relief it will leave marks on your windscreen, which could make it harder to see out of in the long run. Persevere with the heater – it shouldn’t take long to demist. Finally, don’t move off until your windscreen, rear screen, side windows and door mirrors are free of ice, snow or any condensation. Not only is it highly dangerous – it could mean you miss that car coming as you pull out of a side road. It’s also illegal to drive with poor visibility as stated by the Highway Code. Stay safe this winter with offers on winter kits, snow chains, dash cams and more. Visit our shop today.